Adamawa APC reiterated that Buhari remains its candidate for the party’s presidential ticket in 2019. Atiku is from Adamawa state. Before the party’s latest decision, Governor Jubrilla Bidow had declared publicly that the state chapter of the party would back Atiku for the 2019 presidency. Daily Sun gathered that the meeting where Buhari was endorsed for the 2019 presidential poll was convened at the instance of the Adamawa State government. 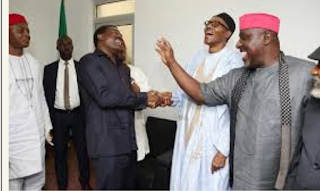 Although the governor was not physically present at the said meeting where the motion for Buhari’s endorsement was moved, his deputy, Martin Babale and his Chief of Staff, Alhaji Abdulrahman Abba-Jimeta, were present. Regardless, at the Adamawa stakeholders meeting last Saturday, which was attended by party elders, members of the National Assembly and House of Assembly, elected council chairmen and party executives from all levels in the state, the party passed a vote of confidence in president Buhari and governor Bindow. They urged the duo to go for another term in 2019. The endorsement motion was moved by former deputy Senate leader, Jonathan Zwingina. Stakeholders argued, among other things, that the success recorded so far in the fight against insurgency, corruption and infrastructural development at the state and national levels were laudable and, as such, deserved to be sustained. Addressing the gathering on behalf of the state government, Abba-Jimeta said Adamawa is interested in seeing that Buhari runs for a second term, to fully deliver on his programmes, and added that as far as “Adamawa is concerned, Buhari and Osinbajo are our candidates for 2019.” He further added that “the standard practice worldwide is for a performing president to serve two-terms in office”. In a related development, the state government has also called on president Buhari to look into the report of the panel which investigated suspended Secretary to the Government of the Federation (SGF), Babachir Lawal, with a view to reinstating him, as long as he has not been found wanting. ”We are aware of desperate moves by some APC members in the state to create problem between the state government and the federal government, just to score cheap points,” Abba-Jimeta added. Prominent among the stakeholders who attended the meeting were Senator Binta Masi, Abdulrahman Shuaibu, member, House of Representatives and the Assembly’s deputy speaker, Mr. Emmanuel Tsamdu, who spoke on behalf of senators, members of House of Representatives and Adamawa Assembly members. He told the gathering that both the state and the federal lawmakers were at home with the resolutions at the stakeholders meeting and would work towards its actualisation.